Utagawa Kunisada/Toyokuni III (1786-1865) Scenes of Famous Places Along the Tokaido Road: Mishima Station (Tokaido meisho-no-uchi) 1863. Oban. This is a rare and an important print for a variety of reasons. Rare, because it is one of the few landscape prints undertaken by Kunisada in the course of an extraordinarily long and productive career. It is important because it comes from a series that is unprecedented in its political collaboration between the ukiyo-e artists and the Shogunate and it is a fine witness to the greatest upheaval in Japanese history for four hundred years. The 250-years Tokugawa Shogunate was on its last legs: the enforced opening of Japan’s borders in 1854, followed by famine and crop failure and a collapsing economy had fatally weakened the Shogun’s power. He would lose authority to the Emperor just two years after this series was completed. As a sign of weakness and a poor grasp on power, the Shogun determined on a procession from the political capital Edo to the Imperial capital, Kyoto. This one series brings together the artists of the Utagawa School in one quite unique effort. From an art historical point of view, the fascinating aspect of all the prints is their homogeneity - despite the widely differing generations and individual styles it is very hard at times to distinguish between say, the work of the youthful Yoshitoshi and Kunisada, now in his 78th year. This particular piece by Kunisada could be read as subversive of the Shogun who commissioned it. 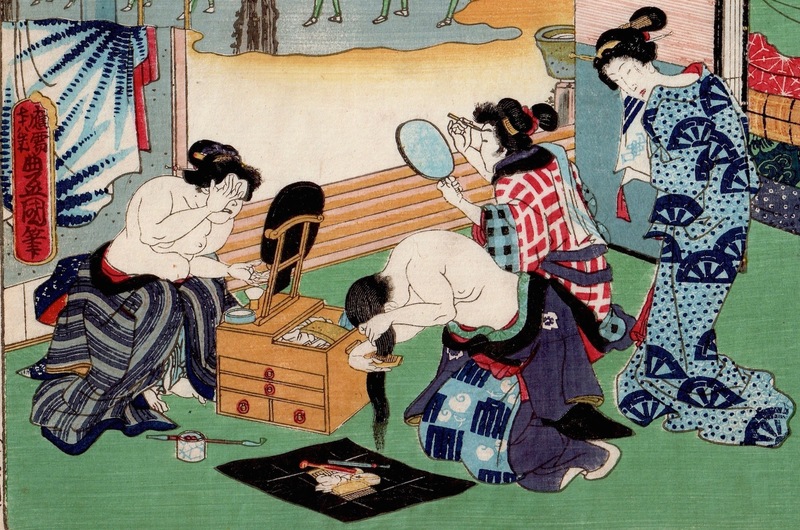 In the foreground are a group of townswomen; Kunisada revives a figure from his repertoire in the shape of the girl combing out her wet hair. Other women in the group are applying make up - these are low caste geisha, drawn in a deliberately vulgar fashion - something which Degas would excel at twenty years later. 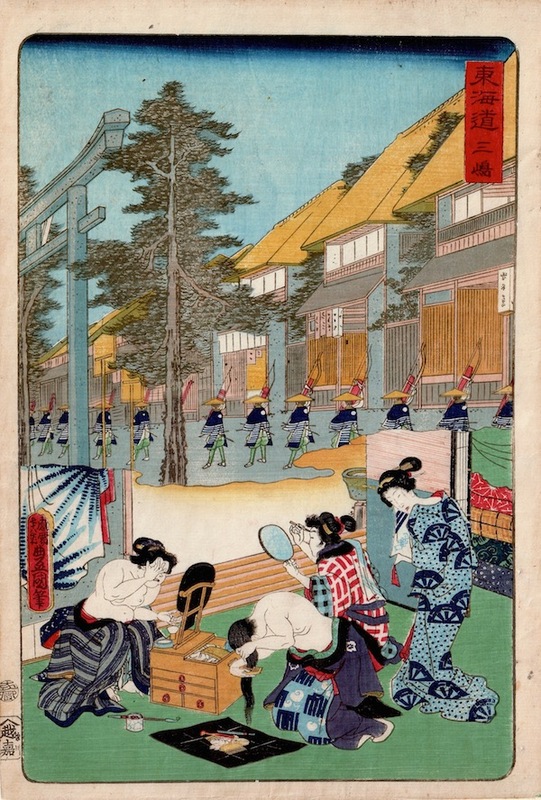 Kunisada places them in a vignette which is separate to the view of the processing Shogun and makes them deliberately oblivious of the passing dignitaries. It is only a few years earlier that failure to bow to the Shogun or his samurai could have meant instant beheading, and yet here in 1863, this print suggests a deliberate affront to authority - a gesture that might well have found sympathy among the urbanites of Edo. The print is full size with margins, condition, colour and impression are all fine. Signed oju nanajuhachi sai Toyokuni hitsu (drawn by Kunisada in his 78th year), published by Sagamiya Tokichi.